Posted February 26, 2018 by Andler Dental & filed under Dentistry, Oral Health. Although our dental office in Madison is focused on keeping our human patients’ mouths healthy, we also understand just how important it is to take care of your furry friends’ dental health, too. During this National Pet Dental Health Month, we’re switching things up to talk about some common pet oral health tips that aren’t so different from your own dental needs. 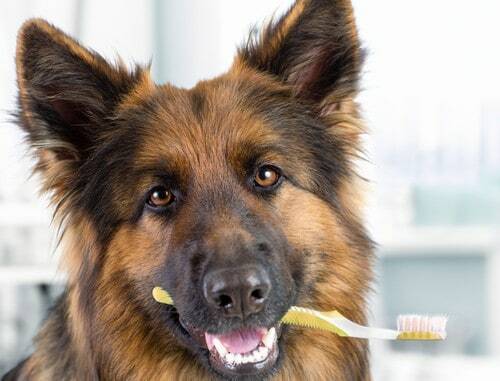 To some, brushing your pet’s teeth may sound unnecessary and perhaps even a bit silly. But our furry friends’ mouths aren’t so much different than ours, and brushing their teeth is an important part of keeping your dog or cat in good oral health. Just like humans should visit their dentist in Madison to get a professional teeth cleaning, pets should also visit a vet to get the same. However, instead of the recommended bi-annual cleanings for humans, pets only need a thorough cleaning once a year. In between those visits, you can take steps to keep their mouths healthy at home. Consider wrapping a piece of clean gauze around a finger and gently scrubbing your pet’s teeth using a dedicated toothpaste just for animals. Doing this two or three times a week can go a long way in fighting tartar and plaque buildup. While we normally discourage our pets from gnawing on things around the house, chewing on toys or bones can actually help strengthen teeth and minimize plaque. But not just any bone or toy will do. For example, a tough, solid bone may be your go-to pick, but these types of bones can increase the risk of breaking a tooth. There are plenty of treats and toys that are designed to stimulate the gums and remove tartar. It should be noted that chewing doesn’t remove the need for proper brushing, just as you eating smile-friendly foods doesn’t mean you should stop brushing. These symptoms also apply to your pet. If you notice any signs of concern, contact your vet as soon as possible. Taking care of your pets’ oral health can set them up for a lifetime of good overall health. Just don’t forget to take care of your own, too. Regular visits to your Madison dentist, along with a great at-home routine, are the best ways to ensure your smile is in the best shape. At our Madison dental office, we’re always welcoming new patients of the human kind and would be happy to see you! Give us a call today!